The Ueda Family takes its name from Ueda city in Shinano Province (modern day Nagano Prefecture). The Ueda family took the name of their city after descending from Ogasawara Clan and its parent house, the Takeda Clan. The Ueda claim their historical roots in the Seiwa Genji through the lineage from Minamoto no Yoshimitsu (Shinrasaburō Yoshimitsu). Under Yoshimitsu, the Takeda Clan branched from the Seiwa Genji. The Takeda Clan then became the parent house of the Ogasawara Clan. Ueda Sōko’s grandfather, Shigeshi and father Shigemoto both served Niwa Nagahide and achieved military fame during the unsettled times of the Genki (1570-1573) and Tenshō (1573-1592) Eras. In 1619 (Year 5 of the Genwa Era) Ueda Sōko came to Hiroshima serving Asano Nagaakira. At this time Sōko had two sons, his eldest Shigehide and his second son Shigemasa. Soon after settling in Hiroshima, Sōko’s eldest son Shigehide was ordered to relocate to Edo Castle as a type of hostage to the Tokugawa Shogunate. In Edo, Shigehide held the role of Hatamoto (Shogunal Vassal of the Tokugawa Shogunate) with 5,000 koku of land. Because of this situation, Sōko’s successor became his second son, Shigemasa. Shigemasa’s descendants retained a fief of 17,000 koku of land and served as the Chief Retainer of the Hiroshima Domain (in service of the Asano Daimyō). The Meiji Restoration occurred during the tenure of 12th generation Ueda Yasuatsu’s (Ueda Jyōō). The current head of the Ueda Family, Ueda Sōkei, is the 16th generation head of the Ueda house of Hiroshima following Ueda Sōko. Son of 10th generation Yatsutsugu and adopted son of 11th generation Yasutoki. Childhood name Junnosuke (順之助), then Shimanobu (志馬允) and later Umanoshin (馬之進) before taking the title and name Naiki (内記). He served as the Chief Retainer of Hiroshima Domain (国老) in the chaos of the end of the Edo bakufu. He led troops from the Hiroshima Domain in the Chōshū expeditions (征長戦 war between shogunal troops and the Chōshū Domain) performed official duties in Kyoto and earned distinguished service in affairs of state. Following the Meiji Restoration he had the foresight to hand the territory of the Ueda Clan back to Hiroshima Domain prior to the reclamation of the Emperor. He took the name Shigemi (重美), then Chigura (千庫) before taking his tonsure and entering the Buddhist priesthood in the third year of Meiji (1870 明治３). He then took the name Sansuigen Jōō (山水軒・譲翁), retired from official duties and dedicated his life to chanoyu and waka poetry. He titled his collection of tea records ‘Whimsical Record of Aesthetic Play’ (雅遊謾録 Miyabi-asobi Manroku) and received the daisu transmission (highest level teaching) from Grand Retainer Nakamura Taishin (中村泰心) at an early age. He put great passion and zeal into composing books on chanoyu and organising the tea equipage of the Ueda estate together with his Grand Retainers. Jōō is hailed as the father of the renaissance of the Ueda Tradition. He later took the further names Shunoku Shōin (春舎松陰) and Rantei (蘭亭), was especially renowned for his skill in waka poetry, well-versed in Japanese and Chinese literature and was revered as a leader. Died at age 69 on 26 December, 20th year of the Meji Era (1888). 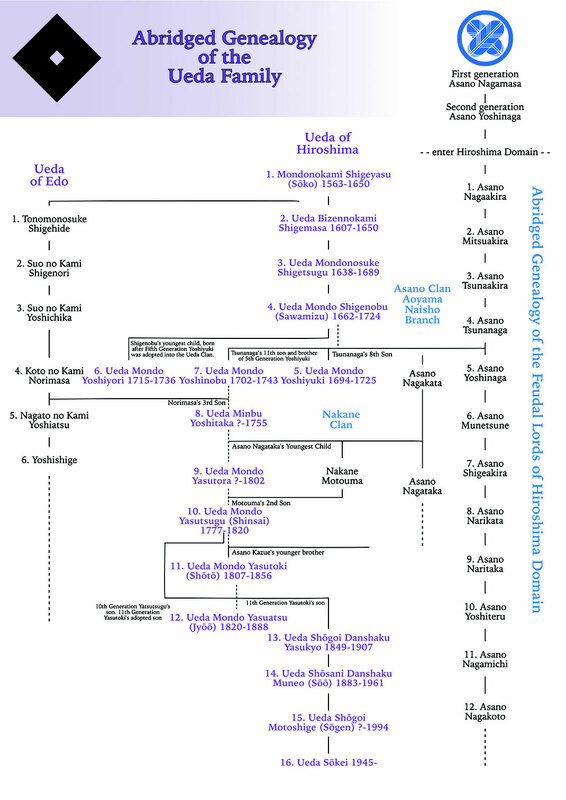 The Ueda Clan changed its official affiliation to Shinto in Yasuatsu's time and are therefore no posthumous buddhist names from this generation on. Twelfth generation Yasuatsu did not have children and so a son of 11th generation Yasutoki named Kinosuke (亀之助) succeeded Yasuatsu. He later received the title Tenzen (典膳) and changed his name to Kamejirō (亀次郎). In the 19th year of the Meiji Era (1886) he became the chief priest of Nigitsu Shrine (饒津神社), where the ancestry of the Asano Clan is enshrined. He devoted himself to the study of the Ōtsubo School of equestrian (大坪流馬術), Heki School of archery (日置流射), Chinese classic literature and Western learning. Due to ancestral merits he became Senior Fifth Rank Baron (Shōgoi Danshaku 正五位男爵). Died at age 59 on 15 February, 40th year of the Meji Era (1907). Yasukyo's oldest son. Took the name Ankantei Sōō (安閑亭宗翁). He was a skilled calligrapher and also studied the Nanga Southern School of Chinese painting under Inada Motokuni (稲田素邦). He composed great works in calligraphy, nanga painting, works of bamboo flower vases and tea scoops (chashaku). Third Rank Baron (Shōsani Danshaku 正三位男爵). Chief priest of Nigitsu Shrine. Died at age 78 on 18 November, third year of the ShōwaEra (1961 / 昭和3). Muneo's oldest son. Sansuiken Sōgen. Original name Motoshige (元重). Restored Wafūdō and created the Ueda Ryū Wafūdō Foundation (財団法人上田流和風堂) in the 54th year of the Shōwa Era (1979 / 昭和54). Chief priest of Nigitsu Shrine and chief priest of Asakta Shrine (淺方社) where the successive generations of the Ueda Clan are enshrined. Died at age 82 on 12 June, 6th year of the Heiwa Era (1994 / 平成６). Grandchild of Muneo. Current head of the Ueda Clan. First titled Wafūdō Sōshi (和風堂宗嗣) and later received the buddhist name Sōkei (宗冏). Original name Jyunji (潤二). Marked the 350th anniversary of the death of Ueda Sōko with exhibitions in Osaka, Hiroshima and Tokyo. Completed a reconstruction of the original formal residence of the Ueda Clan that existed on the grounds of Hiroshima Castle. The reconstruction was made on the current grounds of the Ueda Tradition, 137 years after the loss of Hiroshima Castle in the Meiji Restoration. The transmission of the style of chanoyu particular to the Ueda Clan is due to a special system devised by Ueda Sōko. Ueda Sōko founded an unique tradition of chanoyu alongside his duties as the Chief Retainer of the Domain of Hiroshima and Shō-Daimyo (小大名) of a fief of 17,000 koku of rice. Sōko and his descendants were dedicated to the practice of chanoyu and continued Sōko’s legacy for generations. But Sōko and his successors did not teach people chanoyu directly. Instead, the teaching of the School was invested in two families. In 1632 (9th year of the Kanei Era 寛永九), a man by the name of Nomura Yahee no Jyō Moriyasu 野村彌兵衛尉盛安 of Suō Yanai (周防柳井 modern day Shimane Prefecture) relocated to Hiroshima to seek instruction in chanoyu from Ueda Sōko. Moriyasu served Sōko by governing a stipend of land worth 100 koku of rice. He later took his tonsure and the Buddhist name of Kyūmu (休夢) and became the first Grand Retainer of Ueda Sōko’s chanoyu. One of first generation Nomura Kyūmu’s students of chanoyu was Nakamura Masachika-Chigen (中村雅親・知元). He also served Sōko by governing a stipend of land worth 100 koku of rice. After Kyūmu’s death, Chigen succeeded Kyūmu, becoming the first generation of the Nakamura family to hold the title of Grand Retainer of the chanoyu of the Ueda clan. Ueda Sōko therefore invested the teaching of his style of chanoyu in two families: the Nomura and Nakamura. These two families were employed by the Ueda clan to transmit the Ueda tradition of chanoyu through the generations. It is thanks to the Grand Retainers of the Nomura and Nakamura families that the Ueda tradition has been faithfully transmitted, unbroken, from Ueda Sōko to the present day. After the death of 15th generation Nakamura Kaidō (中村快堂) in 1906 (39th year of the Meiji Era), both the Nakamura and Nomura families were without successors. The role of 16th generation Grand Retainer was therefore awarded to their leading disciple Mukai Chikkadō (向井竹蝸堂). Kakei Seidō (加計静堂) then succeeded Chikkadō to serve as the 17th generation Grand Retainer before his death in 1955 (30th year of the Shōwa Era). Seidō was the last of the Grand Retainers of Ueda Sōko’s chanoyu. With his death, the system of delegating the transmission of the Ueda tradition of chanoyu came to an end. Originally named Nomura Moriyasu (野村盛安), took the title and name Yahee no Jyō (彌兵衛尉) and later the Buddhist name of Kyūmu (休夢). Originally from Suō Yanai (周防柳井 modern day Shimane Prefecture). In the 9th year of the Kanei Era (1632 / 寛永９) he relocated to Hiroshima to learn chanoyu from Sōko and became the Grand Retainer of the Ueda Clan's style of chanoyu along with serving Sōko by governing a stipend of land worth 100 koku of rice. Kyūmu is first generation Nomura Clan Grand Retainer of Ueda Sōko's chanoyu (上田家茶事預り野村家初代). Died on 7 February, second year of the Jyōō Era (1653 / 承応２). Originally named Nakamura Masachika (中村雅親) and later took the name Chigen (知元). A disciple of Kyūmu. The first generation Nakamura Clan Grand Retainer of Ueda Sōko's chanoyu (上田家茶事預り中村家初代). He also served the Ueda Clan by governing a stipend of land worth 100 koku of rice. The Nakamura and Nomura families were employed by the Ueda clan to transmit the Ueda tradition of chanoyu through the generations until the Meiji Era. It is thanks to the Grand Retainers of the Nomura and Nakamura families that the Ueda tradition has been faithfully transmitted, unbroken, from Ueda Sōko to the present day. Chigen died on 26 June, 18th year of the Kyōhō Era (1733 / 享保18). Nomura Yasumune (野村安宗). Kyūmu's oldest son, named Yashichi (彌七). From the age of nine served as Sōko's attendant and later received kaiden (皆伝 all set qualifications of the School) from him. The author of The Sōko Diaries (宗箇様御聞書 Sōko-sama Go-kikigaki Sho). Died on the last day of April in the 9th year of the Genroku Era (1696 / 元禄９). Nakamura Tadayoshi (中村忠美), Chigen's fourth son. Served as the Grand Retainer of Chanoyu for the Ueda Clan and by governing a stipend of land worth 100 koku of rice. Later took the name Chigen (元賀). Nomura Toshinobu (野村敏之). Ensai's second son. Originally called Ryōzo (良三) and later took the name Sokyū (祖休). Died on 13 February in the 5th year of the Enkyō Era (1748 / 延享５). Nakamura Nobusumi. Known by the names Enkai, Taikyū and Tenchikan Chisui. Nomura Sadae (中村延清). Sokyū's son. Originally known as Hide-etsu (秀悦) and later as Tanshin (旦心). Died on 17 November in the 9th year of the Anei Era (1780 / 安永９). Nomura Kiyomasa (野村清明). Son of Tanshin (旦心). Originally known as Fukyūsai (不朽斎) and took the name Kyūmu (休夢) after retirement from official duties. Died on 27 December in the 5th year of the Bunka Era (1808 / 文化５). Nakamura Atsuyoshi (中村篤美). Also known as Chisai (知斎) and Chikkansai Zuifū (竹閑斎隨風). Nomura Yukiharu (野村幸治). Son of fifth generation Nomura Kyūmu. Later took the name Sokyū (祖休). One of the most talented and renowned chanoyu practitioners of his time. To accord with the notable increase of people practicing chanoyu during his time, along with 6th generation Nakamura Taishin (中村泰心) and 7th generation Nomura Yokyū (野村餘休), Sokyū devised a modern structure for the transmission of teachings of chanoyu. Died on 20 September in the 10th year of Tenpō (1839 / 天保10). Nakamura Kazumasa (中村一正). Later took the name Genga (元賀). Nomura Teiko (野村貞固). Son of Sokyū. Took the name Yokyū (餘休). Renowned as one of the ‘Three Geniuses of Hiroshima’ (広島三才) together with Rai Sanyō (頼山陽) and Honinbō Shūsaku (本因坊秀策). In his later years he travelled to Osaka and his fame in tea circles increased considerably. Died in Osaka on 14 October in the first year of Kaei (1848 / 嘉永元). Nakamura Tadakazu (中村忠和). Later called Taihsin (泰心) and Kōrin-an Wasui (香林庵和水). It is known from the notes of disciples that his teaching influence extended to the Kansai area and central Shikoku. Wrote volumes 1 and 2 of the Ueda Tradition of Chanoyu 28 Elements for Practice and Study (御流儀茶事稽古次第目録二十八習乾・坤), showing his adaption to a new era in the transmission of chanoyu. Nomura Moritaka (野村盛孝). Commonly called Enzō (円蔵). Yokyū's adopted son from the Okumura family. He took the further names Yūkoku-an Shōen (幽谷庵松園), Ensai (円斎) and Kaninoya (蟹廼舎). Fought together his lord Ueda Yasuatsu (上田安敦) in the Chōshū expeditions (征長戦 war between shogunal troops and the Chōshū Domain) and left a war diary from the expedition. Frequently appears in Jōō's (Yasuatsu's) (譲翁(安敦)) collection of tea records ‘Whimsical Record of Aesthetic Play’. Died on 15 August, 14th year of the Meiji Era (1881). Nakamura Toyojirō (中村豊次郎). Taishin did not have a male heir and Toyojirō became adopted heir from the Yugawa family (湯川家). Took the name Shōfū-an Kaidō (松風庵快堂). Diligently served the father of the renaissance of the Ueda Tradition, Ueda Jōō (上田譲翁), and appears frequently in Jōō's ‘Whimsical Record of Aesthetic Play’ together with Nomura Ensai. Started the Karaku Association (暇楽会). His work laid the foundation for the establishment of the Wafūkai (和風会). Conducted scrupulous work organising the equipages in the Ueda estate. Died at age 77 on 8 November in the 39th year of the Meiji Era (1906). Mukai Ritsu (向井律). Nakamura Kaidō's leading disciple. As both the Nomura and Nakamura did not have heirs, Ritsu received orders from the Ueda Clan to succeed them as the next generation Grand Retainer of chanoyu. Took the name Chikkadō (竹蝸堂). Died on 20 December, 13th year of Taishō (1924 / 大正13). Kakei Noboru's son. Took the name Kōkatei Seidō (交花亭静堂). Succeeded Chikkadō in the 13th year of Taishō (1924 / 大正13) to serve as the 17th generation and final Retaining Master. Wrote ‘The Chanoyu of the Ueda Tradition’ 『茶道上田流』. Died at age 90 on 7 November, 30th year of the Shōwa Era (1955 / 昭和30).